In the morning, the asthipushpa (sacred remains) of Brahmaswarup Shastriji Maharaj, Brahmaswarup Yogiji Maharaj and Brahmaswarup Pramukh Swami Maharaj were ceremonially taken on a palkhi yatra, circumambulating the Akshar Mandir five times. The sadhus took turns to lift the palkhi in which pots of the asthipushpa were placed. In the afternoon, at 4.30 p.m. the asthispushpa were lifted by palkhi to the Akshar Ghat on the banks of the River Gondali. From there, they were transported in a small boat to the decorated temporary, stage set up in the water for the two days of rituals. Param Pujya Mahant Swami Maharaj and the sadguru sadhus were seated on this stage from where they performed the Vedic Mahapuja of the asthipushpa. Around 1,500 yajmans seated on the banks of the river also participated in the mahapuja. At 6.00 a.m. the diksha mahapuja ceremony began in the presence of Pujya Tyagvallabh Swami on the temporary stage. The two sadhus who were to be given diksha and their parents also participated in the mahapuja rituals. From 6.30 to 7.15 a.m., Param Pujya Mahant Swami Maharaj performed his morning puja, while the mahapuja rituals continued. Thereafter, Param Pujya Mahant Swami Maharaj went to the main mandir to perform the shangar arti. At 8.00 a.m., he returned to the stage and initiated the two sadhaks into the parshad-fold. Then, the ritual dispersal of Pragat Brahmaswarup Pramukh Swami Maharaj’s sacred ashes into the River Gondali took place from the temporary stage. In each of the four cardinal directions, a pot containing some of the sacred ashes had been placed. 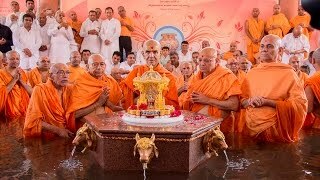 Beginning in the north-facing direction, Param Pujya Mahant Swami Maharaj joined Pujya Dr Swami and Pujya Viveksagar Swami in dispersing the ashes into the river. Then, moving clockwise, he accompanied the sadhus at each location in dispersing the sacred ashes into the water – east: Pujya Tyagvallabh Swami and Narayancharan Swami, south: Pujya Ishwarcharan Swami and Dharmacharan Swami, and west: Pujya Ghanshyamcharan Swami and Krishnavallabh Swami. Afterwards, Param Pujya Mahant Swami Maharaj and the sadguru sadhus went to the banks of the river to inaugurate the Akshar and Brahma Kunds. These two separate bathing areas – Akshar for men and Brahma for women – have been built for relatives to take the ritual bath after dispersing the ashes of their kin. First, Param Pujya Mahant Swami Maharaj placed a pot containing the sacred ashes of Shastriji Maharaj, Yogiji Maharaj and Pramukh Swami Maharaj at the base of a small memorial spot in the center of the Brahma Kund and sealed the memorial spot by covering it with the carved marble footprints of Bhagwan Swaminarayan. After performing pujan and pradakshina of the memorial spot, Param Pujya Mahant Swami Maharaj took a ritual dip in the waters of the Brahma Kund and then went to the Akshar Kund. Here also, Param Pujya Mahant Swami Maharaj placed a pot containing the sacred ashes of Shastriji Maharaj, Yogiji Maharaj and Pramukh Swami Maharaj at the base of a small memorial spot in the center of the kund and sealed the memorial spot by covering it with the carved marble footprints of Bhagwan Swaminarayan. Again, after performing pujan and pradakshina of the memorial spot, Param Pujya Mahant Swami Maharaj took a ritual dip in the waters of Akshar Kund. Then, he blessed the sadguru sadhus, other sadhus and devotees by sprinkling the kund water onto their heads. After all the rituals were complete, the sadhus and devotees who had come for this occasion also took a ritual bath in the kund.